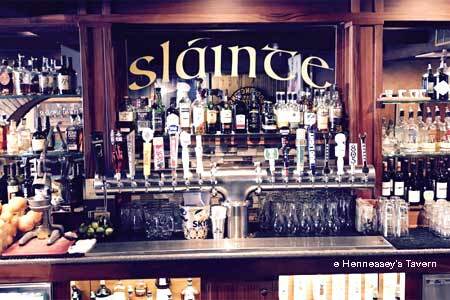 Feast on Irish or American fare, throw back a beer and enjoy the downtown Laguna Beach vibe. : Located in Laguna Beach’s bustling downtown area, this incarnation of Hennessey’s Tavern is a lively spot for breakfast, lunch and dinner. Much like sister locations in Southern California, this venue is a somewhat upscale Irish pub featuring tables, chairs and a bar of dark wood, as well as complementary green-leather banquettes. The long list of Irish brews on draft is a big draw for the bar crowd, and fans of brown liquor flock here for the serviceable list of Irish whiskeys. Breakfast is mostly an American affair, although the morning menu also features a few Mexican and Irish plates to pair with an eye-opening morning cocktail. For lunch and dinner, try the traditional shepherd’s pie or Guinness-battered fish and chips. There’s also a good selection of California-style sandwiches, burgers and salads, as well as a to-the-point kids’ menu.